After Parks was robbed and assaulted in 1994, pizza chain founder Michael Ilitch offered to pay her rent in perpetuity. Wikimedia Commons; Dave Sandford/Getty ImagesLeft: Rosa Parks in 1955. Right: Michael Ilitch in 2007. 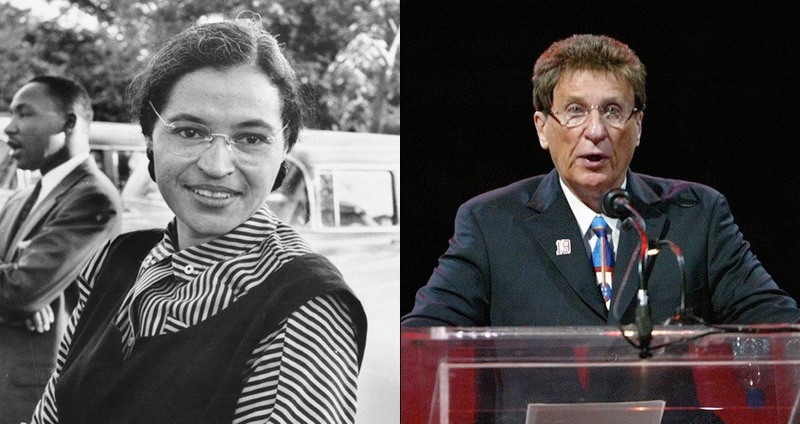 Little Caesars’ founder Michael Ilitch, who passed away this past Friday, personally paid Rosa Parks’ rent for more than ten years. ABC affiliate WXYZ reports that Ilitch offered to pay for Parks’ downtown Detroit apartment after reading an article about the effort to find her a new home following an incident in which she was robbed and assaulted in 1994. At the time, Parks was 81 years old and the incident caused many involved in Detroit’s civil rights movement, such as federal judge Damon Keith, to search for a new home for Parks. She was by this time a long-time Detroit resident, having moved there soon after the Alabama bus boycott. After Ilitch read about Parks’ search in the newspaper, he contacted Keith and offered to pay for Parks’ rent ($2,000 a month) in perpetuity. In total, Ilitch paid for Parks’ rent from 1994 until her death in 2005. The story was first reported in 2014 by Sports Business Daily but kept secret while Parks was still alive. “You’ll never discover new oceans unless you have the courage to lose sight of the shore. Mike and [his wife] Marian had the courage to lose sight of the shore and discover new oceans,” Keith added. It “give[s] you a sense of the kind of man Mike Ilitch was,” Michigan Lt. Gov. Brian Calley wrote on Facebook according to CNN. Next, check out the life and times of Ida B. Wells, one of intersectional feminism’s founders, before finding out everything you didn’t know about the March On Washington.